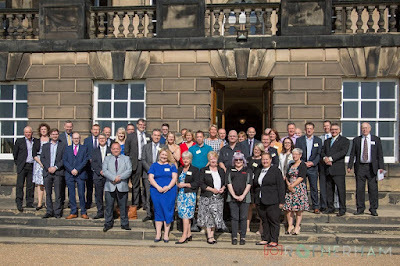 Rotherham Business News has signed up as a Rotherham Pioneer and joined an exclusive group for Rotherham businesses who want to promote the town, celebrate all that is good, and grow the Rotherham business community. Rothbiz is established as the website that brings together positive news regarding businesses, enterprise, commercial property, regeneration, key developments and the economy in Rotherham. The site exists to promote Rotherham as a business location by using stories about the enterprising, innovative, proud, and world-renowned businesses that are based here. The aim of the Pioneers initiative is to bring together the knowledge, networks and influences locally to promote Rotherham as a great place to do business. A major exercise was launched earlier this year using "The Rotherham Story" as a way of promoting the borough. Businesses, from large multinationals like AESSEAL to sole traders like Tom Austen at Rothbiz, will act as ambassadors - Rotherham Pioneers - armed with the story and an outward looking mentality. The aim is to change perceptions of Rotherham and raise its profile. Tom Austen, editor of Rotherham Business News said: "The aims of Rothbiz and the Rotherham Pioneers are very much the same. I set up the website to give Rotherham the positive coverage it deserves, raise the profile of Rotherham, change the perceptions of Rotherham and encourage Rotherham companies to recognise opportunities for collaboration, growth and business development. "I've always envisaged something high profile, paid for by the private sector, with the aim of bringing businesses together and marketing Rotherham - being positive, shouting about what we have got here. The Rotherham Pioneers initiative is just that and the businesses and projects that I continue write about will add more content to the Rotherham story." Through membership packages, Rotherham Business News offers businesses and organisations the opportunity to support the website and the continued promotion of Rotherham, at the same time as raising their profile within the local business community. And Rotherham Pioneers are being offered a special discount on membership packages as Rothbiz looks for more members to get involved and help the site to continue to grow. The website launched as a hobby in 2007 and has been growing ever since. It now has over 7,000 subscribers and followers and receives 20,000 pageviews each month. The membership programme has been designed to enable businesses to show their support and feature on the site at the same time. Different levels based on different budgets offer you the opportunity to be featured on the website and with your backing, Rothbiz will continue to publish three articles each weekday - around 60 each month - focusing on positive stories about amazing Rotherham businesses. Find out more information and become a member here.